Almost all reactions between molecules, whether involving the breaking and making of covalent bonds or non-covalent interactions, result in either the absorption or release of heat. 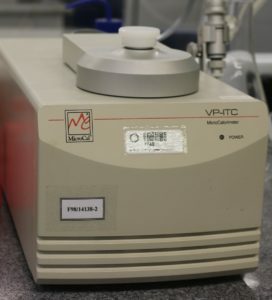 Isothermal Titration Calorimetery (ITC) provides a direct measurement of these heats and is particularly well suited for the study of the noncovalent interactions involved in protein – protein and protein – ligand interactions. It is a thermodynamic technique used for the determination of binding constants, reaction stoichiometry, and thermodynamic profile of reactions, which includes enthalpy (ΔH), heat capacity and entropy (ΔS). It is a truly label-free method, no chemical tagging or immobilization of the components. Also ITC can be done with colored or turbid solutions and particulate suspension. The injections are entirely computer controlled. ITC directs measure heat change associated with a chemical reaction initiated with addition of a binding component. In LEC we have the ITC-Vp Microcal – GE (see manual in the support material).